To rescue her family from financial ruin, lovely Victoria Shelby has no choice but to marry. 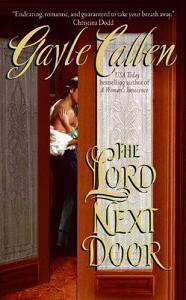 Her options for a bridegroom are limited...until she remembers the shy servant boy next door. Then she discovers that her childhood friend is actually Viscount Thurlow--ruthless businessman, future earl, and a man whose family is shrouded in scandal. After two rejected marriage proposals, David Thurlow needs a wife who will give him an heir, someone who will not only overlook his past but also be above reproach. Victoria is the ideal candidate--quiet, unassuming, and in desperate need of funds. But even as she strives to be the perfect wife, David's slow heated lessons in the art of seduction threaten to transform a "convenient" marriage into a torrid and passionate affair. "Endearing, romantic and guaranteed to take your breath away." This is my Private Journal--how dare you spy on me and presume to write in it! You may be ten years old, but so am I, and I would never be so rude! You left the notebook under a bench in your garden where anyone could find it. I live right next door, and from my window, I happened to see you hide it. I didn't come any closer, I promise. Your bonnet hid your face, so I didn't see you. My mother always says my curiosity will land me in trouble, and here it has. I do not know much about music (which you seem quite fond of from what you wrote about your lessons) but I am certain we could find something in common. My mother is the earl's cook, and I have no father or brothers or sisters. I'm allowed to be tutored sometimes with the earl's son. Think of me writing to you as a way I can practice my lessons. Can't we be friends? I've never had a boy for a friend. I suppose writing to you can cause no harm. But I can never meet with you. You would get into trouble if the earl discovered that his kitchen boy presumed upon the neighbors. And my father would take my journal away if he thought I was consorting with a servant. He says we always have to associate with people above us, but since we're below them in status, why would they want to associate with us? It's all so very confusing. My father is a banker who invests the money of wealthy people. Even the earl who employs your mother is one of his clients. I have a mother and two sisters named Louisa and Meriel. Louisa is two years younger than I, and she has very red hair that my mother says is unfashionable, but which I think is uncommonly pretty. Meriel is four years younger than I, and her hair is golden ringlets. My hair is just this pale yellow color that doesn't really look like much of anything. Don't worry about your hair-it isn't important what a girl looks like. It's what she talks about that matters. Someday I'll convince you to meet me so we can have a real discussion. You're lucky to have sisters. You always have someone to play with. What do you do all day? I help my mother in the kitchen but I can play outside as much as I want. I have a secret hiding place in the attic. It's where I keep all of my most important things, like special rocks from the garden and paper no one wants because only one side is used. I like to hide in there where no one can find me and think about important things, like sailing to India or to one of those islands by the colonies. I'm telling you things I've never told anyone. See, you can trust me. I would never be brave enough to go on a long, dangerous voyage to India. But I'm glad you have so much time to think. Little girls have not so much freedom. My father hired a governess so that I can be properly educated like a lady, but I think my sisters like that better than I do. At least Louisa does. French is very hard (and why do we need it if we just finished a war with them not so long ago?). Mathematics make my head spin. Meriel is lucky. She is still allowed to play much of the day. Though thankfully music and needlework are part of my lessons. I also have to learn all about rank, like earls and dukes, and who goes into the dining room first, and who escorts whom. Really, why do I need to know all about the nobility if they won't invite us anywhere? Mama says we have to be prepared, because she wants to make sure my sisters and I marry the right men. Doesn't falling in love make a person the right man? I like that you have a secret place to hide. I do, too. I call it Willow Pond, although that is not its real name. But I can't tell you where it is right now. It's a secret. Your tears are getting the notebook all wet and dirty-don't cry! I keep telling you to explain to your mother why you don't like to dance. She'll understand and make that nasty governess stop. No one should have to dance. But if you need someone to talk to, I could meet you at Willow Pond. I know you only go there with your sisters. You always go on and on about that place being magical, but it's a corner of your garden, Victoria. Why won't you share it with me, too? I'm not like my sisters. I'm not like any other girls, and there are days my father won't look at me because of it. I don't like the things ladies are supposed to like, like babies and husbands and dresses. I want to play the Piano all day. I hear songs in my head that no one has created yet. I think of designs for my needlework because the pictures intrigue me, not because needlework is what a Lady Should Do. You've returned from the country! It was such a long three months. You have such an unusual situation-your mother traveling with an earl. Tell me everything you did, and don't leave anything out-unless it involves the inside of a frog. You talk about that too much, and I don't care if you call it scientific research. I may not like the thought of traveling myself, but when you tell me stories, I can imagine it all and live through your eyes. Don't listen to your father. Men like ladies who think. My mother reads the newspaper and thinks a great deal. We have long conversations, but then I'm her only child. She says she appreciates my opinions. Have you tried talking to your parents? If they're worried about who you'll marry, tell them I will marry you. You don't think about balls and dresses like some silly girls do. When you marry, I hope you find a lovely woman. But she can't be me, because my father would never allow it. That is truly sad, because you understand me more than any person in my life, except my sisters. So let us think of the Perfect Wife for you. She would have to be a grand adventuress, of course, and not mind riding on elephants in India. You'll probably earn your fortune there and come back as quite the wealthy gentleman. (Don't scoff! I know you care little for the nobility, but perhaps the gentry will make room for a fine man such as you will become some day.) The Perfect Wife would be very brave, of course, and able to speak passionately about what she believes in. She'll read the newspaper, and know about Parliament and wars and famous men. My sisters are very worried about me, but I am not like them. I will be content to be our parent's companion as they age. I love nothing better than to be at home with my music and my needlework. You know I hate to dance-what man would want a wife who can't dance? Father is angry again. Only to you can I complain how unfairly he always focuses on me. He punished me again by locking the door to the music room. Why won't he tell us what he's angry at? We can never question him. I'm worried that Mama knows what it is. Yet certainly she would not keep something important from us. Why haven't you written to me? It's been months, and I know the earl is in town, so you must be there somewhere. I heard that the countess died, and that must be a terrible strain on the household. I'm so sorry. Surely your mother was able to keep her position. Yet--you're almost a man now at sixteen. Did you feel the need to look for work? Wouldn't the earl keep you in his household? Or have I offended you? I look back over the past year's correspondence, and perhaps I asked for too much pity as I made a fool of myself at the dinners my parents insisted we attend. They have friends amongst our own class, wealthy people who believe they're the equal of any member of the ton. But I sit there like a silly lump, with nothing to say, getting names wrong whenever I speak. Oh Tom, why is it so easy to tell you everything? I even promise to finally meet you in person, if only you'll keep writing to me. I miss you. I pray that you're still next door, that by some miracle after all this time you'll come looking for our Journal. My father is dead, and the circumstances of his death would shock even you. My sisters have left to try to make their way in the world and help Mama and me. But the small amount of money they send home is not enough, Tom. Even as I write this, I am listing what item I'll next sell to feed us. My mother and I will be on the streets in only two months’ time. I'm so desperate. Oh Tom, will you marry me? Victoria Shelby closed her childhood journal, feeling utterly foolish for writing in it after so many years. As if a servant could help her now, when everything was so bleak. She'd thought of Tom occasionally through the years, wondering if he'd moved away, if he'd married. But for days now, she'd found herself thinking about him frequently, and at the oddest times. It was growing more and more difficult to banish him from her thoughts. And marriage? Desperation must surely be driving her mad. She looked about her sparse bedchamber, bare of anything of value but her simple furniture. It had once been such a magnificent town house, and now it seemed so empty, just like the sedate future she used to imagine for herself. She'd been a foolish, naive girl. With a sigh, Victoria smoothed down her mourning dress and left her room for the uncertainty of the master suite, where her mother now lived alone. She paused in the doorway and met the gaze of Mrs. Wayneflete, their housekeeper and last remaining servant. She wore her usual uniform of black silk dress, lace collar and close white cap. No matter their situation, Mrs. Wayneflete could always be counted upon to remain unflappable. Together, they turned to stare at Victoria's mother, who clutched a vase to her bosom and stubbornly turned her back on them. "Victoria, I will not part with this," Mama said, her defiance a hollow, pale sound. Her eyes were now lined with dark shadows and looked at nothing most of the time. Sadness bent her shoulders and strands of gray hair escaped the pins. "Your father gave it to me for our anniversary. He brought it from-"
"I remember," Victoria interrupted gently. "But Father would understand that we need to eat." Her mother had a strange tendency to forget their circumstances, and Victoria found herself growing ever more impatient. Didn't she realize that they had all sacrificed? Victoria had sold her beloved piano, and Mrs. Wayneflete had taken no wages in many a month. Mama was waiting for salvation, but there was no one left to save them. Victoria wished she could convince her mother it was better to face the future than wallow in the past. But since Father's death ten months before, her mother's spirits continued to sink, though Victoria's cheerful letters to her sisters did not dwell on that sad fact. There was no need to worry them any more than necessary. Victoria sighed and turned a brisk smile to her housekeeper. "Mrs. Wayneflete, do you have another suggestion for an item that will keep us in food this week? I do believe that Mr. Tillman quite looks forward to haggling with me over a price." "You're an easy woman to respect, Miss Victoria," Mrs. Wayneflete said with a fond smile. "Then there is Mr. Billingsly, the merchant from Cheapside. I could pit the two proprietors against one another for a better price." Victoria's laughter died when she saw her mother staring at her. "How can you find amusement in this?" Mama whispered. "Your father is dead." "Oh, Mama, of course I know that. But we are not dead, and we owe it to ourselves to go on living." Victoria pushed those sad memories away. Since that terrible day, she and her mother had seemed to switch places, as her mother foundered under the knowledge that her own husband had left them penniless. The long overdue mortgage on the town house, their last remaining property, had been bought by a distant cousin, who had agreed to let them remain until he returned to England with his family-two months from now. Time was running out. Her sisters were doing what they could. But their earnings barely supported themselves. Meriel had used her logical nature and excellent education to find a position as a governess. Louisa’s sweetness and patience had enabled her to become a companion to an elderly lady. Victoria had thought she was doing her share by keeping their meager household running, for she had not her sisters' talents. Lately she'd felt the urge to do more, to prove that she was no longer that shy girl who used to think she deserved so little in life. Had all she ever aspired to be was her mother's companion and caretaker? Yes, it once would have given her the chance to immerse herself in her beloved musical compositions. But that silly girl had come to know firsthand the harsh realities of life without privilege. And it was time to do something more. "I do believe there is a clock in Meriel's room," Mrs. Wayneflete said. "Quite an old, fancy piece. Would that do?" "Of course." Victoria nodded briskly, having long since accepted that she was the one to make all the family decisions. "Mama, you can have the vase for a while longer." "Something will happen, Victoria," her mother said, a look of shining hope in her dull eyes. "You'll see." Victoria's thoughts were tinged with sarcasm that was uncalled for. It was so easy for her to lose patience with her mother these days, though good breeding kept her from expressing her opinions. Mama had once aspired to the highest reaches of society, as if riches could make the ton forget that Mr. Shelby had been their trusted banker, not their equal. It had frustrated her mother terribly that wealth had allowed her to live in the same exclusive neighborhood as the nobility, but not to mingle with them. That unrealistic hope shining from her mother's eyes made Victoria even more determined. There had to be a solution. She thought of Tom again, that boy she'd never met, but with whom she'd shared the intimacy of her every thought. She had to stop such silly daydreaming and get on with the day. She wrote the clock into her household journal, where she kept lists of the items they'd had to sell. At Tillman and Sons, Mr. Tillman quoted her a reasonable price for the clock, and Victoria left feeling a moment's triumph, followed by the inevitable worry that never truly went away. As she walked slowly through the busy city streets, her thoughts dwelled inward, searching for a solution she could not find. Distractedly, she turned down an alley, a shortcut from the shopping district to her wealthy neighborhood. She used it every week, yet she was still surprised when she found herself all alone. The sky was overcast with the promise of rain, making the coach houses and stables on either side of her seem full of shadows. She heard a strange crack behind her and looked over her shoulder, but there was nothing. She picked up her pace. Before she reached the halfway point of the alley, she felt certain she was being followed. She'd left Tillman and Sons with an empty satchel-anyone could figure out that she now carried money with her. And she was a woman alone. Why had she chosen the luncheon hour for her shortcut, when all the coachmen and grooms were obviously inside enjoying their meals? She picked up her pace, debating whether a confrontation would deter a thief. She was only two blocks from home! So she picked up her skirts and ran. She heard pounding steps behind her almost immediately, but she didn't risk looking over her shoulder until she came out on the street. As she made the turn to stay on the pavement, she saw a dirty, skinny little boy, not more than eight, dressed in ragged clothing. He seemed even more desperate than she was, for he continued to follow her. Two men walked a block ahead of her, and she felt safe enough to fumble in her reticule. She grabbed the first coin she found-a shilling-and threw it over her shoulder. With a glance, she saw the boy fall to his knees and scramble for the money. Only after Victoria had crossed the street and left him behind did she allow herself to slow down and catch her breath. A year ago, she would never have been able to run like that. Helping Mrs. Wayneflete with the cleaning had obviously improved her stamina. The little boy had disappeared, and she hoped he would buy himself a hot meal. Biting her lip, she couldn't help shuddering. Would his life soon be hers? She passed the home of the Earl of Banstead, right next door to hers. The house lived under a cloud of scandal many years old, but one that Victoria had been deemed too young to hear about. She'd given up questioning her housekeeper about the servants' gossip years before. She couldn't imagine that Tom still lived there-surely she would have had some word from him. She came to a stop and stared up at the huge town house with its gleaming windows and impressive entranceway. Was the answer to her problems in there? But she had never been an impulsive woman, so she resumed walking home to help Mrs. Wayneflete with dinner-and came up short before she reached her property. The idea rolling around in her mind was so wildly impulsive that she felt the need to give in to it immediately, before she could change her mind. Her heart pounded, her gloves dampened with perspiration. Was Tom the answer to her prayers? But what if he wasn’t married? She could be a servant's wife. She'd become quite the frugal housekeeper, and she knew she could be content with Tom. She hadn't wanted to marry. It had been too difficult to flirt with men. Since she loved nothing better than to be alone with her music or her needlework, she had thought that would content her. It had been a relief when her mother had given up on marriage plans for her, when her father's disapproving looks had turned to indifference. He had always made sure Victoria knew it would be difficult to find a husband for her. But now marriage might be the only answer. Could this actually work? Could she save her mother-and herself? She marched up to the Banstead front door and knocked before she could change her mind. Too late, she realized she should have gone around to the servant's entrance in the back. But someone was already opening the door. An imposing butler, wearing black livery and a white wig, bowed to her. "Good afternoon." "Good afternoon. Forgive my impertinence, but I am looking for a manservant who once worked for you-and might still work for you, of course." The butler stepped aside and she entered the two-story entrance hall. A graceful marble staircase curved up one wall, a corridor led to the rear of the home, and several closed doors hid other rooms. The butler studied her. "The servant's name, miss?" "I never knew his last name," she said, "but his mother was once the cook here. The boy's name was Tom, and he would be twenty-six years old by now." "Miss, since I have been with the earl for nearly thirty years, I can assure you that--"
A door suddenly opened, and a tall man stepped into the hall, quite taking her breath away with the power of his presence. He was dressed in somber colors with the most expensive fabric and cut. He had dark brown hair, cut close to his head as if to hide wayward curls he couldn't control. Though some might not call him handsome, his face with its intimidating cheekbones and dark, heavy brows was definitely striking. But it was his eyes that had unnerved her. They were the palest blue, frosty with intelligence, a winter glance in springtime. He studied her more intently than any man had right to do to a stranger. She lifted her chin and tried to appear calm, when inside her every insecurity was bubbling to the surface. The man turned to his butler. "I'll handle this, Smith." "Very good, my lord." After giving a bow, Smith left the entrance hall and motioned the footman to leave with him. "I am Viscount Thurlow. And you are…"
Memories came flooding back of countless parties where she stuttered talking to every man, but she forced them away. She wasn’t that girl anymore. "Miss Victoria Shelby, my lord. I live next door." "I know the family name." "You live next door," he said dryly. She tried to smile. "Oh yes, of course. My lord, I am looking for-"
"A servant named Tom," he interrupted. "I overheard." "Does he still live here? If not, perhaps I could speak with your steward for a forwarding address." His examination made her feel uncomfortable and even annoyed. "Miss Shelby, there is no other way to say this except to be blunt. I'm Tom."